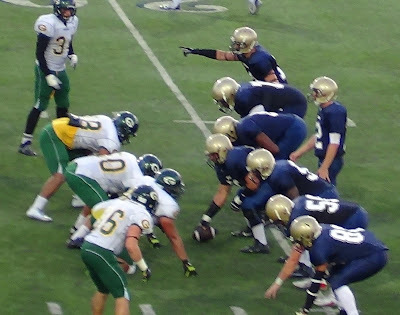 MESA COLLEGE (09/14/2013) Grossmont (2-0) took another step towards catching up to San Diego Mesa (1-1) in the all-time series after a 63-7 win over the Olympians at Merrill Douglas Stadium on Saturday night. The tone was set from the opening drive when it took the Griffins just a few plays to get their first touchdown. The touchdowns kept coming as the Griffins held a commanding 28-0 lead at the end of the first quarter. The Olympians got their only score of the game with 8:06 left in the first half. Sophomore quarterback Joe Kennedy found tight end Gio Gonzalez, who dove in the end zone for a 14-yard touchdown. The Griffins would go on to add 35 unanswered points hitting the 60-plus point mark for the second straight game. Next up for Grossmont is a trip to to Glendora for a 1:00 p.m. kickoff against Citrus (2-0) on September 21st. Mesa will also be on the road that day for a 6:00 p.m. meeting at Glendale (1-1).